Hello and Happy Terrific Tuesday to you! Hope you are enjoying your day so far. 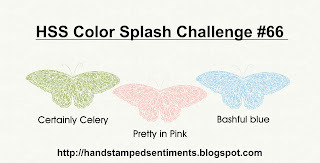 It's time for another fun, weekly challenge over at Hand Stamped Sentiments. 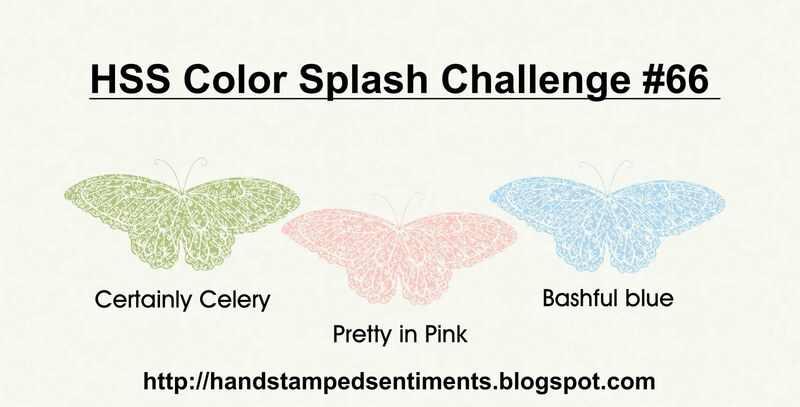 This week we are having some fun with a fabulous "Color Splash" challenge. Please check it out and play along! I used one of my favorite stamp sets, Kimono Kids, for the main image. (Click HERE for another card with this set) I just think this little gal is adorable and I really like all the details on her kimono. So sweet! There is a LOT of sparkle on this one! I got a little carried away, haha! Total bling count: 21...23 if you include the tiny pearls in the little gal's hair. As if that wasn't enough, I "smooched" the textured background with some Vanilla Shimmer Smooch Spritz. I can't get enough of the Smooch. It's such an easy way to add some pizazz to any project. All of the supplies used are listed at the end of the post. Oh so cute!!! That sketch had me running for the hills (again) but you made it look quite easy! Love your little oriental girl....she is sweet! This is so sweet, really puts a smile on your face. Love the colors and of course the bling. TFS. Oh, Anne Marie, you rocked these challenges! Such an adorable card! Fab uses of your bling too! I just love your stamping style! Oh, this is so sweet! Love all the bling! 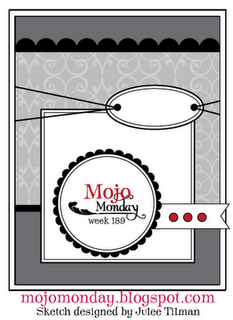 Thanks for playing along with Mojo Monday! Delightful little card, Anne Marie! What an adorable card Anne Marie! Love all the bling & the inside as usual....your creations are always so FAB! TFS!!! I've been supah busy creating for my neighbor's niece & for my son's graduation. I hope to have some time to actually post to my blog by Thursday morning...wish me LUCK!!!! Love it Anne Marie! I don't have those cute kids. Wish I did. This is precious! Love the border, the bling...and the soft color palette! Oh my goodness! This card is so blingy-bright, I gotta wear shades! Who says there can be too much of a good thing? Not this gal! I LOOOOOVE this! Thank you for inspiring me! This is so adorable. Lovely colors. This is so pretty! I love the bling and the soft colors. The inside is lovely too (as always) You did a great job with the sketch. This one had me scratching my head. LOVE how crisp and clean this is...and the touch of bling is PERFECT! Super cute card! Love all the bling. Your card inspired me to submit to the Mojo challenge this week. Great card, I love all your bling. The little pearls in her hair bow are perfect. Darling image too! Very nice - love all the bling. Great job with the sketch challenge!!! That one was a doozie! The little girl is too cute!!! Are those brads around the scallop circle or is that the smooch? Either way - I love it! Super cute card. Reminded me of the Cherry Blossom festivals I attended when I lived in Torrance, CA. Great job on the coloring.